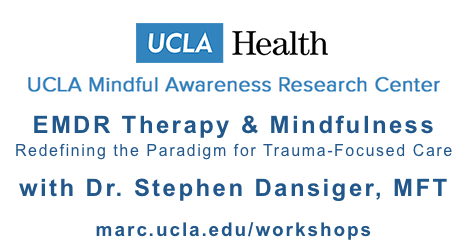 Dr. Steve will present EMDR Therapy and Mindfulness: Redefining the Paradigm for Trauma-Focused Care at UCLA. It is presented as part of the workshop series at the Mindful Awareness Research Center (MARC) which is is a partner of the Norman Cousins Center for Psychoneuroimmunology within the Jane and Terry Semel Institute for Neuroscience and Human Behavior at UCLA. Other presenters over the years have included Dr. Daniel Siegel, Diana Winston, Dr. Sue Smalley and many others. As with other times this workshop has been presented, 6 APA CEs are available and 6 EMDRIA Credits as well. This event is for clinicians and others both those trained in EMDR and those curious about the therapy.